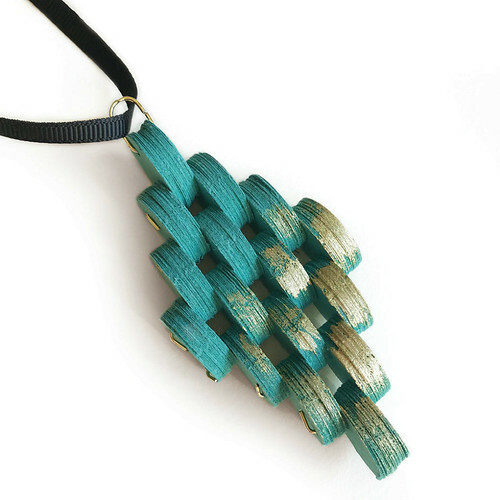 I've been coming across more and more artisans who are creating truly beautiful paper jewelry. That means a new round up is in order, just in time to accessorize your spring or autumn (hello Down Unders!) wardrobe. 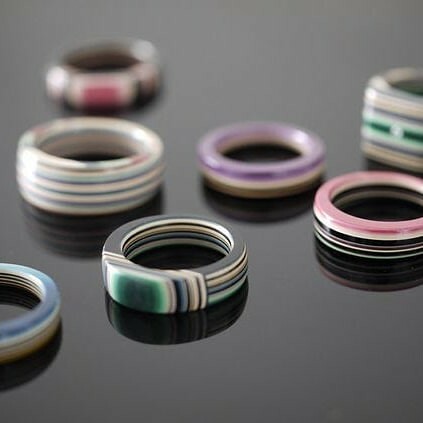 I first featured Alfieri Jewel Design in Milan, Italy about a year ago in this paper jewelry round up. 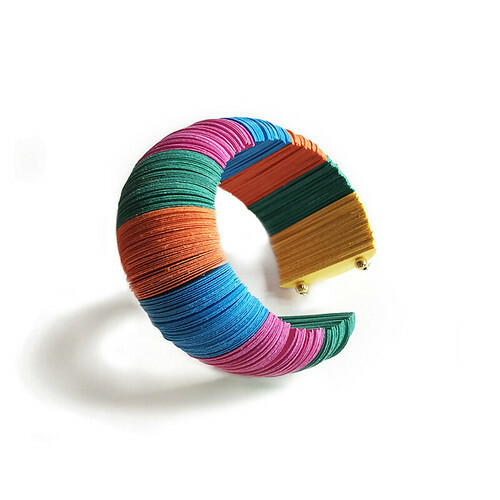 Since then, Verde Alfieri has been busy creating lots of stylish new pieces... for example, her wide, yet lightweight bangle bracelet is made up of hundreds of half-circles. Two interior molded steel wires preserve the shape no matter how many times you slip it on and off. 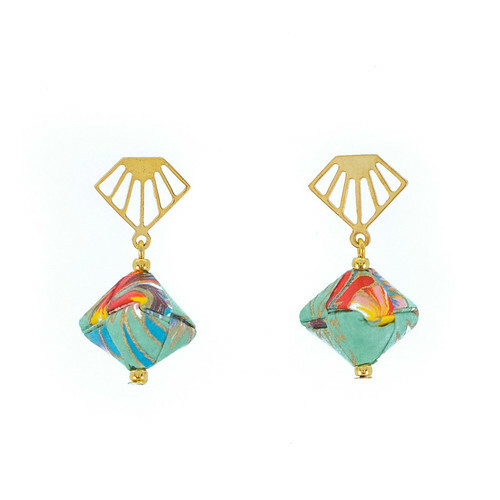 Here's a summery combination of turquoise ovals with gold leaf. As one who loves a touch of metallic shine, this necklace is calling my name! 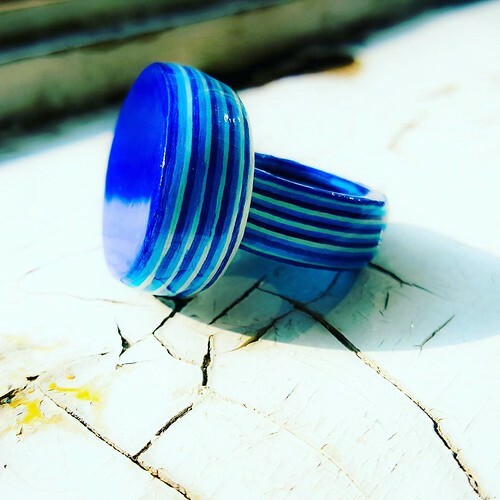 Corinne Sandkuhler of Sandbrooke Studio in Baltimore makes modern jewelry pieces using upcycled book pages... perfect presents for your eco-conscious friends and totally appropriate as graduation gifts too. Each piece is coated with layers of water resistant sealant so you can count on durability. As with any paper jewelry though, use care when wearing and storing it. 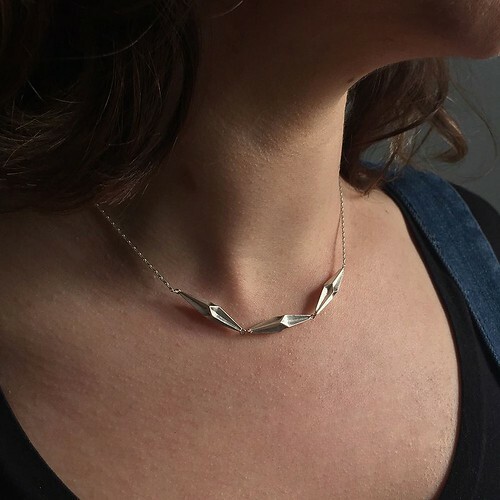 Elysha Roberts of Elysha Joy Metals in Martha's Vineyard, Massachusetts combines traditional and non-traditional techniques to create wearable art pieces reminiscent of pods and seeds. 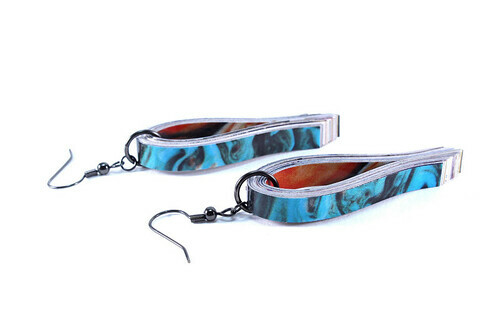 These light as a feather earrings would swing, sway and surely be noticed. I'm admiring this springtime beauty that reminds me of graceful parasols... it has been selected as a finalist for the 2018 Saul Bell Design Award in the Alternative Materials category. 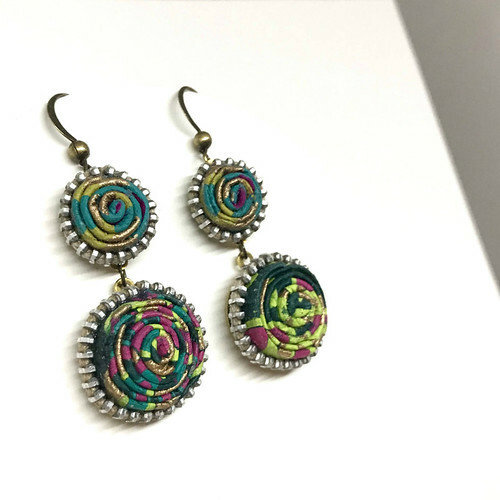 Blog sponsor Marti Emmons of Coco Delay continues to define her paper earring and necklace collections... here she's combined beautiful handmade papers with recycled zippers for a cool look. I gave a pair of Marti's rolled paper and tassel earrings to my sister for Christmas and has she ever enjoyed them. 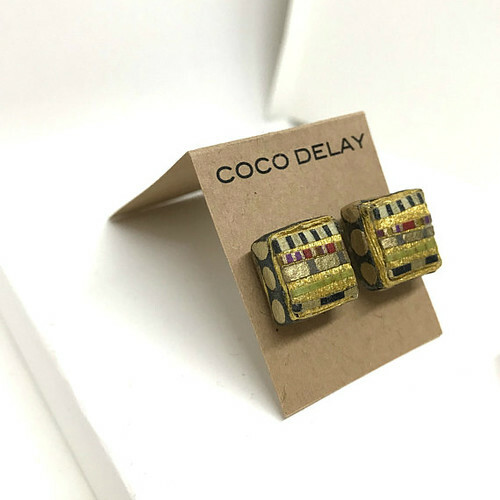 This square pair of studs combines the rich colors of exotic papers with the look of paper folding. Boho chic! 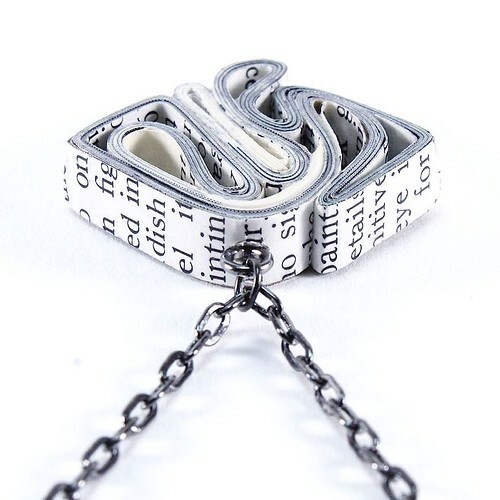 Mayumi Origami is another sponsor here at All Things Paper and if you've been reading my posts for any length of time, you might recall what a fan I am of Renata Mayumi's paper jewelry. I own one of her necklaces and have gifted several pieces... each one is accented with special findings. 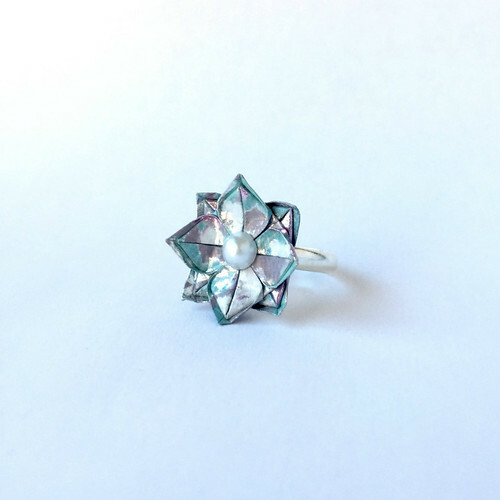 In nice weather Renata can be found selling her jewelry at outdoor markets in Lisbon, Portugal, but there's no need to travel... just click over to her shop to see all the latest designs. Oh! And I just learned that Renata has a new collection of paper jewelry that is very different from her origami line... more about it in an upcoming post. The Woman is a Budapest, Hungary shop that features beautiful stacked paper rings (you'll need to use Google Translate). The Woman describes her first collection, Planetae No.1, as surprising color combinations, definite formatting, style mixing and sophistication. I agree! 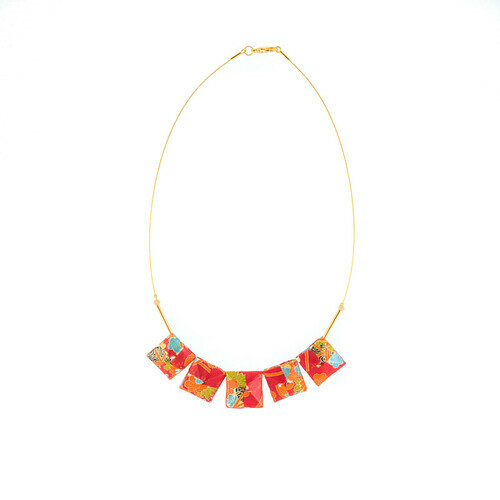 Strong and polished, each piece is composed of layers and layers of colorful paper. 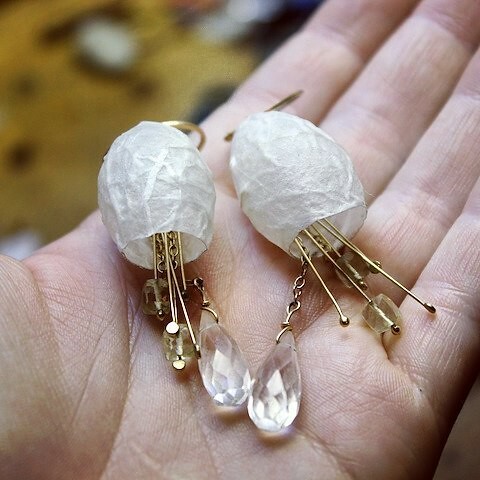 Stephanie Schick of S.CHICK in Germany is another blog sponsor whose jewelry I've had the pleasure of seeing in person. Each piece is beautifully made with care and precision. 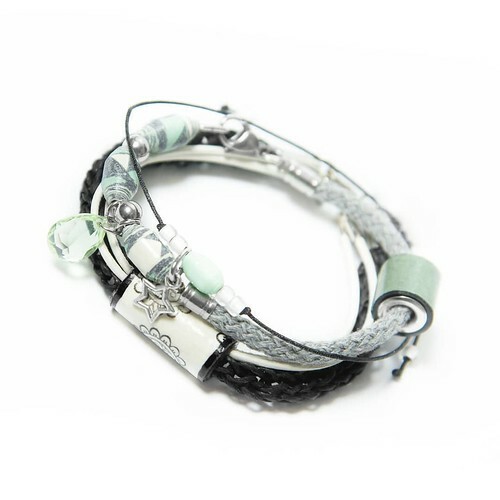 I love the new mixed media paper bead bracelets, as well as pendants that feature her bold graphic art. You'll notice that her shop is in German, but again, use Google Translate. Also, Stephanie speaks English and will be happy to assist you with a purchase if you message her via Instagram or Facebook. 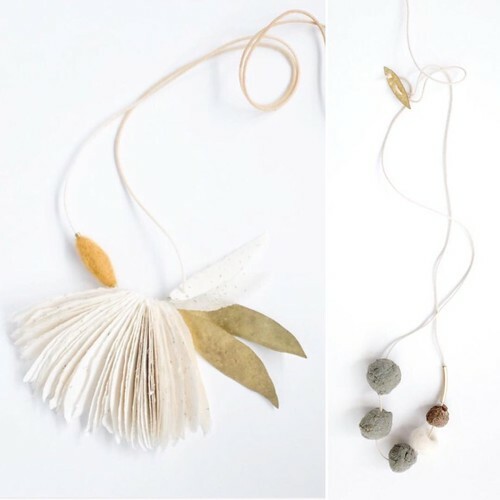 Jody Dunphy of Second Nature Project in Portland, Oregon is a graphic designer who makes exquisite seed bomb bead necklaces and leaf necklaces using seeds from her own garden. 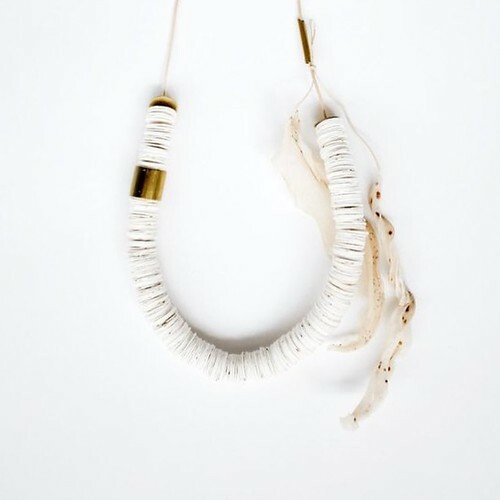 This necklace is made of stacked handmade paper discs embedded with clover and pollinator-friendly flower seeds. 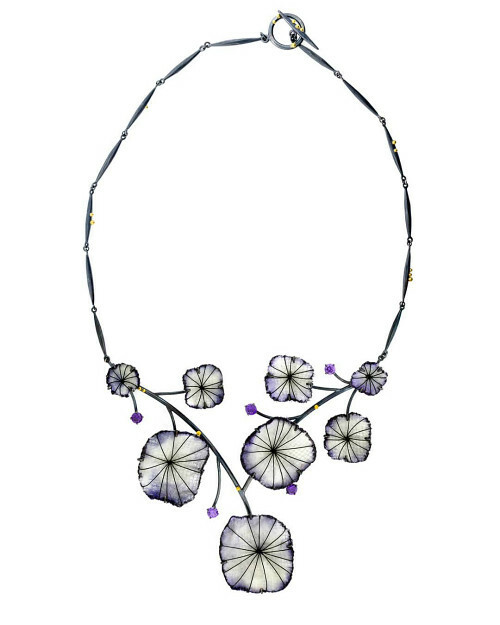 The discs can be torn off and planted as you go about your day, elevating the necklace from just a necklace to a seed dispersal accessory. The paper discs can be removed a few at a time so there is no need to plant the entire jewelry piece at once. Truly a gift that keeps on giving, but of course it's fine if you decide to keep it just as it arrives. Cathryn Gaylord of Blue Bassoon in Boston is a maker of tiny origami jewelry, as well as a professional musician and PhD student. Her early love of folding has evolved into making pretty and useful items. Cathryn's rings, earrings, and necklaces are practically guaranteed to attract attention considering their eye-catching shine and small scale. 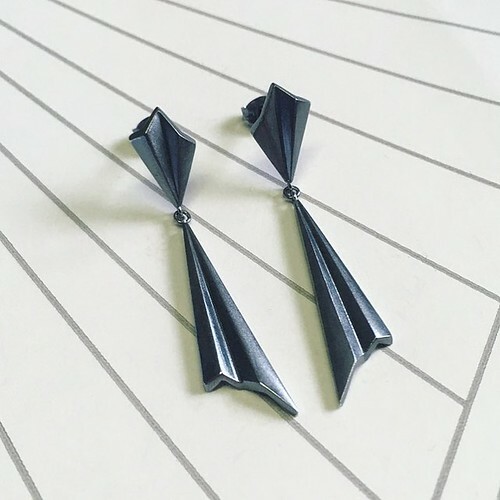 While the polished pieces made by jewelry artist Alice Barnes of Alice Barnes Jewellery in Brighton, UK are actually metal, the sharp angles are inspired by the cutting and folding of paper... and so I can't help but include Alice's work in this round up. My collections originate from a playful exercise in which I limited my materials to small squares of silver sheet. By carefully piercing, forming and sometimes combining squares I realised that just as in origami there were endless possibilities, and this was the beginning of my ‘Square Roots’ range. My latest collection ‘Pleated’ continues to be inspired by paper, but to get the sharp folds and weighty quality I wanted to achieve I decided to turn to wax carving and the ancient lost wax process. 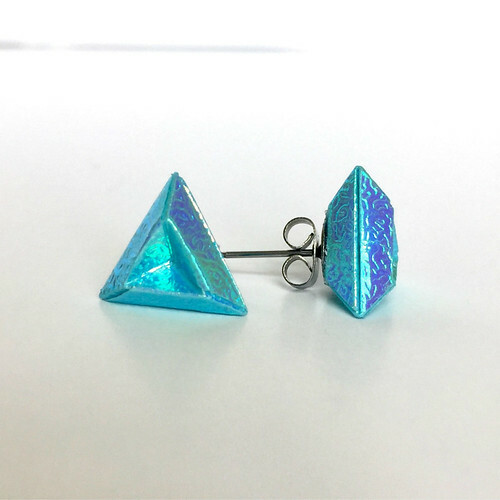 I must have at least another dozen paper jewelry makers waiting in the wings so stay tuned for future features and keep an eye out for a really nice jewelry giveaway coming up in a couple of weeks. Last thing for today... 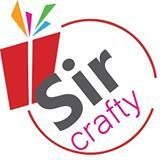 I enjoyed being interviewed via the new site Sir Crafty. Get to know a bit more about me and my crafty habits here [edit: site no longer available], as well as check out easy paper projects by P. Kumar. I think so too, Maureen, thanks for your comment! these are soooo beautiful works - thnx for sharing! I'm glad you enjoyed the post, thanks Sabine!